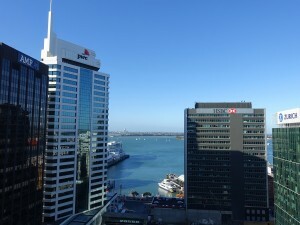 I spent relaxing 7 days of vacation with my wife and our son in Auckland, New Zealand. This post is to share our general itinerary, hoping to give some idea if you plan to visit Auckland any time soon. First, some background. We are Australians and it was our first trip to New Zealand. We always thought that New Zealand is very similar to Australia. Turns out, while there are indeed a lot of similarities, some notable differences are there too. Our young toddler is almost 2 years old and this is our first overseas trip with him. Travelling with our child is never easy and requires a lot of preparation. We realised this from the day we started planning for our family vacation, hence we deliberately created somewhat relaxed schedule instead of a busy one. The fun started early in the morning of day one. Had a little laugh watching Air NZ funny safety video. I think all other airlines should have put more effort in making their version of safety announcement video. The food was simple scrambled eggs, yet it was easily one of the best scrambled eggs I’ve ever tasted on a flight. Flight from Melbourne to Auckland took around 3.5 hours. Arrived in Auckland and withdraw some cash from ATM. Big mistake. Even though my Australian bank (CBA) promotes no percentage fee (just $2 flat fee) for cash withdrawal in New Zealand’s ASB ATMs, the conversion rate is bad. I ended up getting my NZD for a conversion slightly above 1 AUD, which shouldn’t be the case if I just do normal exchange at one of those currency converter outlets. Went to our hotel using Super Shuttle service that we had booked earlier. It was a hot day and we couldn’t feel the aircon inside the car at all. The 50 minutes journey was far from enjoyable. As soon as we entered Auckland city area, we can quickly see that there are a lot of road works, which we found out later they are building underground railway, so this disruption will stay for few years to come. After hotel check in, our first move is to get some (very late) lunch. We went to a food court across the road recommended by hotel receptionist and indeed they do serve good food. Many different options and taste great. Or maybe our hunger made everything tasted better, we’re not really sure. We decided to get some takeaway for dinner so we won’t have to worry about it later. Next thing to do is finding a department store to buy things we need for our son. We opt to pack only things we need for the first 2 days in our luggage and buy the rest in Auckland to minimise the things we need to bring. Other parents would understand. Young children are small, but the things they need are a LOT and will take up serious space. Quick stroll around the hotel gave us general idea about where to find important stuff like medicines, breakfast options etc. Spent the night at hotel room with an excited toddler exploring new place. That marks the end of day one. For day two, we booked a half-day tour around Auckland. We started from the city, exploring various places, visited Auckland Domain, stopped at Narrow Next Beach, Devonport, went up to Mt. Victoria Summit, stopped for a scenic photo of Auckland Harbour Bridge, did another quick stop at Viaduct Harbour with tons of boats. Good starting point to get to know the city, and testing our son’s reaction to some extended hours inside a tour vehicle. Based on this learning, we get better idea about what to pack for the next day. The second half of the day was spent mostly for more city self-exploration, some shopping, some culinary adventure (tasting food from new places, yay). Day three has one main agenda: visiting Hobbiton. 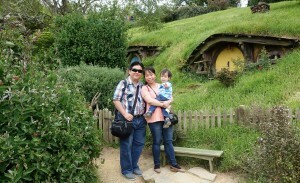 If you’re a fan of the Lords of The Rings movie (or Hobbit movie), you’d know what Hobbiton is. Took us more than 2 hours from Auckland to Hobbiton, and it was worth it. Hobbiton was beautiful, and unique, and would give us countless photo opportunities. Too bad I just learned that we could only took photos from the outside of those hobbit’s houses. I imagined we could enter those houses and took indoor photos. Apparently those houses are only built from the outside. We couldn’t enter any of those houses because there is nothing inside. It’s just solid ground. The indoor part of the hobbit houses are build in South Island (Auckland is located in North Island of New Zealand). So they are actually two different locations. The Hobbiton journey was closed with a visit to the Green Dragon Inn and tasting their famous Girdley Fine Grain, Amber Ale. It was really good ale! Then we had a lunch buffet, which was actually better than my initial expectation. After the first three days of really beautiful sunny weather, our day four was raining. 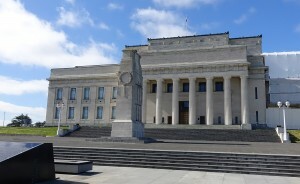 Our original plan was to visit Museum of Transport and Technology Auckland (MOTAT). We cancelled this plan because of two reasons: the rain, and our quick googling showed it might not be the best place of interest for our young toddler. Maybe later when he’s older, but for the current him, it won’t be a super interesting place to visit. 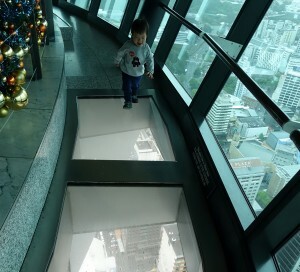 So we changed to another venue: Sky Tower. It is close from our hotel and it’s completely indoor. We spend quite a bit of time there and our son really loved the place. Even more so when we got him New Zealand’s Kapiti ice cream at the cafe. Some other relaxed time at the evening enjoying our hotel room while playing with our little boy. We started day five from Viaduct Harbour. From there, the next few hours was spent to meet friends who live in Auckland. 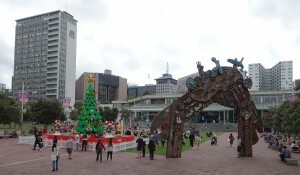 We went to Aotea Square to see the Lego Christmas tree and enjoy the evening. Our son really loves playing with many birds there. 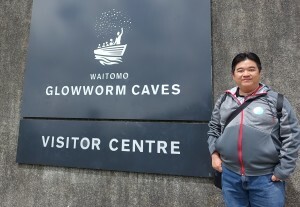 Day six is another busy day with pre-booked trip to Waitomo Glowworm Caves. It took 2.5 hours to reach the location, and another 2.5 hours to return to Auckland. Is it worth the trouble? I’d say yes. The pitch-dark cave with thousands of glow worms looked amazing, so out of this world. Too bad the tour duration over there was too short. 45 minutes of tour compared to total 5 hours spent on the road makes the whole thing questionable. To make things worse… the tour that we book chased us with very tight timing, making it virtually impossible for us to do anything after the tour, like getting proper lunch because 2.5 hours of trip with empty tummy is not going to be fun for anyone. I wonder who planned the tour timing; he’s either drunk, downright cruel, or sees us visitors as non-humans. We started our day seven with some packing and preparation for another flight day. To allow us some extra time to browse around the shops in Auckland airport, we booked our Super Shuttle an hour earlier. This second trip with Super Shuttle was better than the first one. Perhaps because it was not a very hot morning. Auckland airport does have some nice stores selling various things. I checked most of the prices are somewhat similar to what I would pay in Australia, so we ended up not getting anything. If you comes from another country, some of the items might be interesting and unique. In general, we quite enjoy our short little break in Auckland. The city itself looks great and the food is amazing. I would love to revisit just to see more nature and exploring the food. There is one little note, though. Even though our tour guides generally said that Auckland is a safe city, to be honest it didn’t feel as safe as what we usually feel in Melbourne. In some areas we can clearly sense that some people gave us some uncomfortable look every time we pulled out our phone to check Google Maps. Our alert sense turned out to be true when we experienced one little incident. Two guys were literally almost grabbing my wife’s backpack. Lucky she saw the hand’s movement from glass reflection and quickly stopped the incident. The backpack only contains milk, nappy, baby food and other baby equipment though, but the potential thieves didn’t know that and were ready to grab it. Another disappointment is that Auckland city does not do accessibility nearly as good as Melbourne. Only within my very short visit, I spotted more than 10 places in Auckland CBD without proper access for prams and wheelchairs. This might not be a big deal for some, but certainly a problem for families with young children or for people with disabilities. It is either impossible or difficult for people with prams or wheelchairs to access those places. I guess after living in Melbourne for quite some time, I kinda take for granted the fact that I can bring my son’s pram to almost everywhere without having to worry about access. This experience makes me appreciate my city a lot better. There are few things that New Zealand does right compared to Australia. Their $2 coin is actually bigger than their $1 coin. Yes, I’m looking at you, whoever designed Australian coin and decided that making smaller $2 is a good idea. Also, New Zealand’s 50c coin is reasonably sized, not an oversized piece of metal that always make my coin wallet unnecessarily heavy and bulky. Auckland has more stores from American brands compared to Melbourne. So there are few things we can only buy online in Melbourne, we can browse the physical stores in Auckland, which is awesome. Did I mention that the food are great there? I think I did, yet I will repeat it again. Every meal we tried there was satisfying. Even some random outlets from a random food court that looks very old, the food still tasted yum.